I discovered Lamb's Quarters last summer. Once I recognized the distinct shape and growing pattern of the leaves, I realized I'd been pulling and tossing them into the compost for years. Once I actually tasted a leaf, I knew I'd just hit a jackpot. Lamb's Quarters has a rich and interesting history. It has followed the spread of civilization for thousands of years, and has been traced as far back as the Neolithic (stone age) peoples. Through the ages it has been revered as an important and delicious wild food, growing in abundance wherever the land has been disturbed. It has a tendency to grow and spread prolifically, and for that reason some settlements were actually named after it! Though most obviously eaten raw or lightly cooked, the seeds were also used by different groups of peoples. Some American Indians still grind the seeds into a flour to make a dark, nutritious bread. Though gardeners pull this 'weed' from their garden and usually curse if its gone to seed, I argue that it has an important role to play. Tenth Acre Farm includes it in the top 5 weeds you actually want in your garden because it accumulates so many nutrients in its taproots and also loosens the soil. In Carrots Love Tomatoes, garden expert Louise Riotte claims that allowing a little lamb's quarters to grow alongside certain crops actually aids their growth, vitality, and sometimes taste. 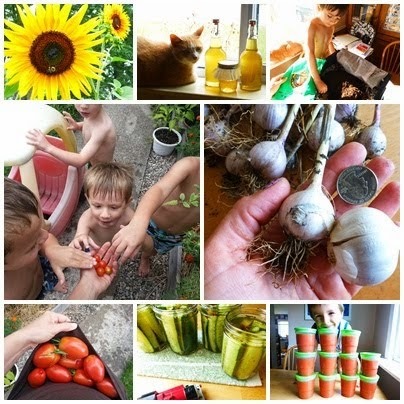 In her list of lamb's quarters companions; potatoes, corn, cucumber, melons, and marigolds. You don't necessarily want lamb's quarters to grow uninhibited, since it spreads so readily, but allowing small patches to grow here and there may help your garden out a bit while providing you with occasional harvests of fresh greens through the summer. It's a smack-down! Before spinach hit the scene in the sixteenth century, lamb's quarters was one of the most valuable greens of European settlers, since it grew natively and with virtually no effort. However, some settlers brought spinach from southwest Asia and this novel, cultivated green rapidly became more popular. The historically noted contest between lamb's quarters and spinach is interesting to me, since I've always found that they taste so similar (and in fact, are from the same plant family). This spring in my garden, lamb's quarters WINS. Despite carefully sowing and tending my spinach, it barely grew. I did nothing for the lamb's quarters and it created a bounty. It keeps providing greens for us even as the days grow hotter, long past the time when spinach would bolt. I'm not saying I'm giving up on spinach, far from it; I plan to make spinach one of my biggest cool-weather crops this fall and winter. But as the lamb's quarters in our garden continues to grow and we continue to enjoy it, I'm declaring it a champion. Spinach and lamb's quarters are very similar nutritionally. 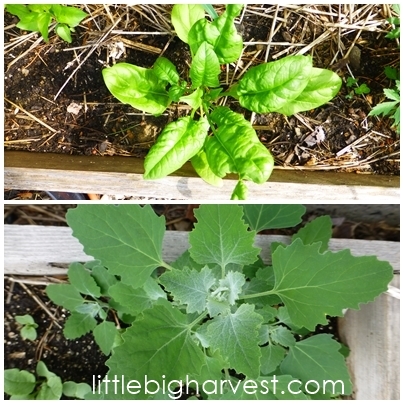 Lamb's quarters is richer in vitamin C and vitamin A than spinach, though spinach contains more potassium and iron. Both are very rich in calcium. In the kitchen, these plants are interchangeable--you can substitute lamb's quarters for spinach in most dishes, or use a little of both. You can enjoy lamb's quarters all summer long without having to plant it or tend to it; it can be found virtually everywhere, and thrives from June through September in most zones. If harvesting from your garden, it's easiest to cut the stem at the base of the plant. This will prevent too much disturbance of the soil--the roots will decompose underground and help create humus--and will keep your harvest nice and clean, since the huge roots tend to spray dirt if pulled. The stem can get quite thick, so you may need to use bypass loppers or pruners if your scissors aren't quite up to the task. *A word of caution--lamb's quarters, due do its thick, deep taproot, absorbs nutrients from the soil, especially nitrogen. Along with nutrients, the plant can absorb pesticides and other impurities. For this reason, please do NOT forage lamb's quarters from industrial fields (they are a major weed in soybean fields). I would avoid foraging them anywhere you question the purity of the soil, as well. In your own organic backyard, there should not be an issue. Most gardeners will tell you eliminate lamb's quarters before it goes to seed, or it will take over the garden (after all, one plant has the potential to produce up to 75,000 seeds--some dormant and some non-dormant). The dormant seeds can burrow into the soil and stay for up to 20 years or more! Despite the warning, I left one plant alone last fall and let it go to seed, and sure enough, come spring I had a bountiful harvest. quite beautiful in its own right, resembling amaranth. This spring we had quite a harvest of lamb's quarters. 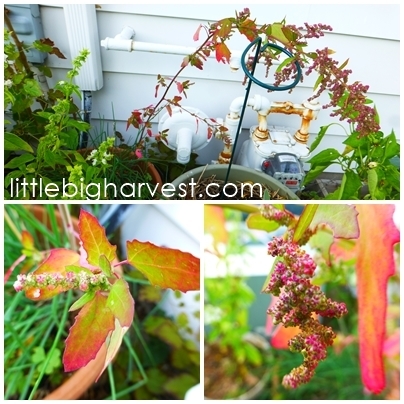 I have a feeling this weed is here to stay--and that's okay with me! As long as I keep it in check in early spring, harvesting all or most of the tender leaves before they go to seed, I'm hoping to keep lamb's quarters around as a managed, edible weed, year after year. Once I've eaten what I want, I weed out every remaining plant, and top the garden beds with fresh compost so that my annual vegetable plants can take over for the summer. Enjoy Lamb's Quarters as one of the first greens of the year, in any recipe you'd use spinach. Click here to check out my recipe for Lamb's Quarters Poppers ....they are so good!